Meet Mr. Chemex, one of my new favorite brewing methods. This little coffee maker produces one of the best cups of coffee by removing all the bitterness and leaving a pure coffee taste. You can use regular or chemex coffee filters. If you use a chemex filter, they are a big circle folded into a cone. You want to place the side that has 3 layers toward the pouring spout. After you added your coffee grounds (1 tbsp. for 5 oz.) you want to boil your water. Once the water is boiled, wait until it stops boiling vigorously. You will then pour a small amount of water on the grounds; just enough to wet them without floating. This allows the coffee to 'bloom' and this little part of the method is what takes out the nasty bitter taste some other brewing methods have. After a minute or so you can pour more water and finish brewing. The total time to brew is about 5 minutes. It really does taste great. Also, I think the coffee maker in and of itself looks awesome. 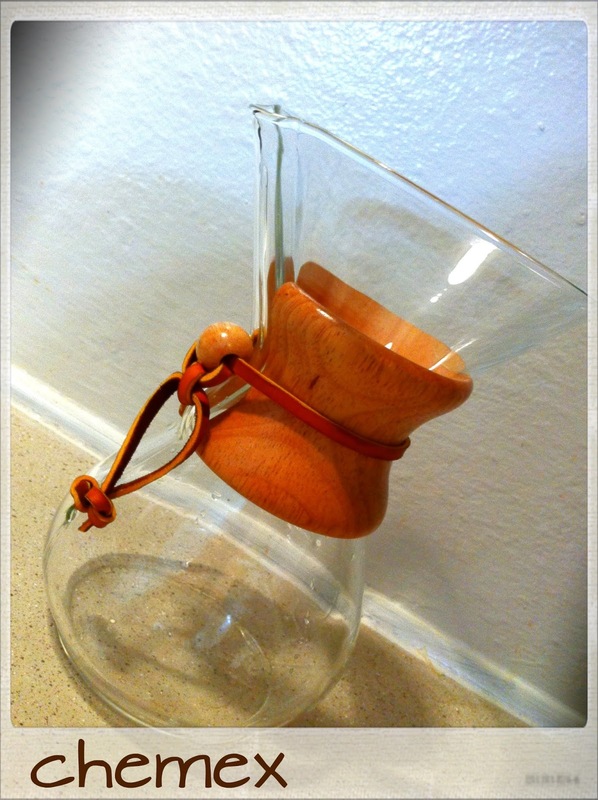 If you are interested in purchasing one you can check out the chemex website for more information. Are you a coffee drinker? What's your favorite brewing method? Also, I'm featured today on one of my favorite blogs, Will Run for Margaritas, where I talk about my fun running adventures. Check it out and also check out Melody's blog! She writes all about running and is a great inspiration. Thank you for posting about the Chemex! That sounds like it would make really good coffee! It is so cool looking! I am usually an espresso/latte drinker so I use a Nespresso mechine that I love! I'm intrigued. I need to try this! Awesome post.I really like it.